Set in the foothills of the majestic Rocky Mountains in Colorado Springs, MorningStar at Bear Creek is privileged to provide assisted living dementia care to those with mild to advanced Alzheimer’s disease and other forms of memory loss. As you can see from below, we offer all of the amenities and services required to ensure our residents’ utmost comfort, wellness, and safety along with a loving team of professional caregivers. 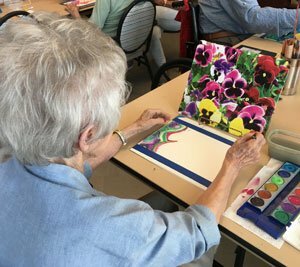 MorningStar at Bear Creek is proud to be an official Memories in the Making host site, enabling us to offer structured painting classes for memory-impaired residents. These art pieces are then eligible for inclusion in the Alzheimer’s Association’s MIM high profile events. Every aspect of our one-story residential home is designed with the needs of our special residents in mind, and thus allows them the independence to freely and safely move about their expansive surroundings. MorningStar at Bear Creek residents receive 24-hour care, access to a full-time nurse, and a responsive, caring team that is the very heartbeat of our community. Utilizing the best therapeutic approaches to dementia care, our wellness program includes recreational and meaningful activities that leverage the power of music, life skills, art, aromatherapy, and animals to heal and comfort. Each day our energies are put toward finding ways to connect with and nurture the essence of the individual regardless of the extent of memory loss, and to treat residents with the respect and dignity they deserve. We also believe it is important to support our residents’ families as they go through this unexpected journey with their loved ones and to help them better understand the disease. Please contact us to learn about availability and pricing at our loving assisted living dementia care community. MorningStar at Bear Creek brings a unique vision to senior living with our mission statement: “to honor, to serve, to invest.” With a foundation built on honoring God, valuing our seniors and hiring staff with a felt calling to serve, we are dedicated to creating a true home for residents in a serene setting. Please schedule a tour to experience Colorado Springs’ most trusted assisted living dementia care.